People look to Portland to discover what’s next in the fast-moving trends of food and wine. From a gastronomy standpoint, the Willamette Valley metropolis produces a much bigger dot than its relatively modest population might suggest. Falling somewhere between cannabis-infused craft ale and Chinese-inspired soup dumplings, the latest trend, it seems, is chef-backed wine bars. The most eagerly anticipated of the bunch, Canard, represents the latest installment from local superstar chef Gabe Rucker. Situated just across the street, Canard is to Le Pigeon as Whisky Soda Lounge is to Pok Pok — at least on the surface. A conveniently located wine and small-plate spot, it doubles as an area for those awaiting the main event. But, as the menus suggest, it’s a place worthy of its own visit, for sure. 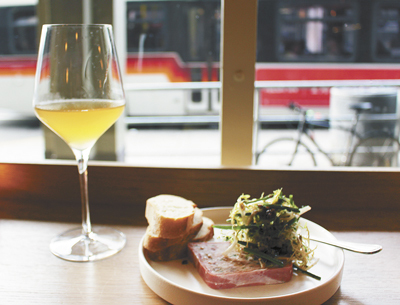 Amid the bustle of Burnside Street, Canard is an ideal spot for a glass of wine while surveying the town’s many personalities ambling by. The interior is Euro-minded in its simplicity, with a small J-shaped bar and — much like Le Pigeon — seating so close to the chefs you can taste their work. Yellows and browns afford an earthy calm to the place. While the setting is perfectly suitable, the focus is clearly on what’s poured and plated. Glass options include a handful of sparkling selections and a healthy batch of whites, spanning Burgundy, Alsace and the Loire, along with offerings from Spain and Georgia. An “In Between” section highlights a couple rosés and orange wines, while the red pours are, expectedly, French-focused with fun finds such as a 2014 Gerard Raphet Gevery-Chambertin Champs Chenys. Other beverages include beers on draft and a resourceful cocktail list replete with Rucker’s greatest creations, like the Foie Turn, a foie gras fat-washed bourbon with Sherry wine, apricot brandy, bitters and Sauternes. Canard’s bottle list is extensive, prefaced by a candid intro: “Take wine seriously, but never too.” French labels generally predominate, with healthy incorporations of white Burgundy, Chablis and Beaujolais, but there’s also tremendous selection from Alsace, Spain, Italy and our very own Willamette Valley. A fetching cast of lesser-known California Pinot Noirs showcases labels like Littorai and Porter Creek Vineyards. The food matches Rucker’s impressive résumé. Current standout dishes include roasted carrots with sweet-pea hummus, sesame and radish honey; and the Uni “Texas Toast,” with avocado, finger lime, fish sauce and garlic butter. Plates like the foie gras dumplings with peanut sauce, apple and miso-roasted shallots appeared quite popular, and a host of house-made terrines and mousses simply beg for wine. Overall, it’s fine dining by bar standards — fresh and flavorful without ostentation. Rucker, a James Beard award winner, opened Le Pigeon in 2006 at the age of 25. The French-inspired restaurant stands out as a perennial favorite for “best of the year” in a city flooded with culinary talent. Rucker also started Little Bird, a simplified sibling eatery, located downtown and home to some amazing happy-hour prices. Chef Cathy Whims has also entered the wine bar game. Enoteca Nostrana opened in April, located in a former yoga studio adjacent to her award-winning east-side Italian restaurant, Nostrana. The name exudes Old World, referring to the many regional wine shops throughout Italy. The 40-seat joint sports a wine list by Austin Bridges, who impressed many during his tenure at nearby restaurant D.O.C. Clean and cool, the space contains architect’s lamps, a towering bar and eye-catching tile work. A pair of private dining rooms spans two floors, the lower version set before a glass display of cellaring wines. Where Canard is sparse, warm and traditional, Enoteca Nostrana feels steely, angular and quite modern in layout and atmosphere. Clever details exist everywhere, from the sliding bar ladder to barstool seats shaped like Champagne corks. The wine list seems approachable, with more than a dozen options by the glass. The new venture is rumored to be the result of Whims wishing her Nostrana staff enjoyed more wine than cocktails. In that sense, there’s a fair amount of discovery here, from industry favorites like Occhipinti of Sicily to pink wine from Tentino in northern Italy. Remarkably, two dozen orange wines grace the current menu, most from Italy, along with Champagne, Riesling, Barolo and some intriguing French and Italian blends. Whims’ abbreviated food menu features items such as burrata, a warm smoked oyster dip, Lasagne Verdi alla Napoletana and a make-your-own pasta option. Other dishes of note include the Antipasto Ortolano with coriander-marinated asparagus and charcuterie boasting Vin Santo-chicken liver pâté crostini. Equal parts regional and authentic, it conjures up memories of your favorite al fresco experiences. 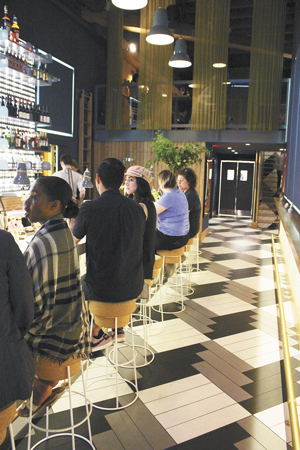 The city boasts more chef-owned wine bars, to be sure, with more likely to come. In addition to being a “love letter” addressed to wine, the movement is perfect for the wine enthusiast. Lists full of surprises and chef favorites will only inspire palates and encourage linear imbibers to act more adventurous, without having to empty their wallets completely.